Growing with Great Difficulty – Fix it with I-Ching #39 蹇 Lame’s Teaching! When meeting obstruction, pause and see clearly. We must resist the urge to react too quickly. Pause first to see the situation clearly and then develop the response. Always choose to response positively to any situation, specially the adverse ones. Don’t prejudge too quickly. Check your direction and positioning. Are you positioning your offering in the right place at the right time? When a Chocolate company expanded into India, they have to sell their chocolates in smaller sizes and lower prices, provide cooler to keep the chocolate in good condition, and position it as items for celebration. What about your offering and positioning? Take the right way that leads to success and not the short-cut evil way that eventually brings failure. There are always option available to us. If you think there is none, think again. Think outside of yourselves. See point 3 below. Under difficulty, you will be tempted to take short-cut. Don’t do it. Stick to the righteous way. Always seek and follow advice of the wise. Be bold and unashamed to ask for advice and help. Just make sure you ask the right people and not just anyone. Building character will brings long lasting success. Long lasting business can only be built on unchanging foundation of truth and righteousness. Build this culture throughout your organization. Wait for the right time to move especially for things beyond our control. Growing business needs one to watch the trend. Is it a once off or a real growing shift in taste, demographics, technology, etc? Even the great Steve Jobs said, “I will wait for the next big thing”. Check up 05 需 Needs – Wait for the Right Time for details as well. See also The Patterns of Chinese 36-Strategies where wait is one good option. Get first hand knowledge and then work together to seek the interests of the community and not self. Rapid moving company needs the information from the front-lines – the people serving the customers. It is difficult to have a hierarchical structure for information to filter up to the boss to get the truth. It will be too slow and usually distorted. Get the organization to be more opened and transparent so that information can be shared quickly and truthfully. See how the successful companies like HCL tech, The Morning Star Company, WLGore, Google, Zappos, etc operate. 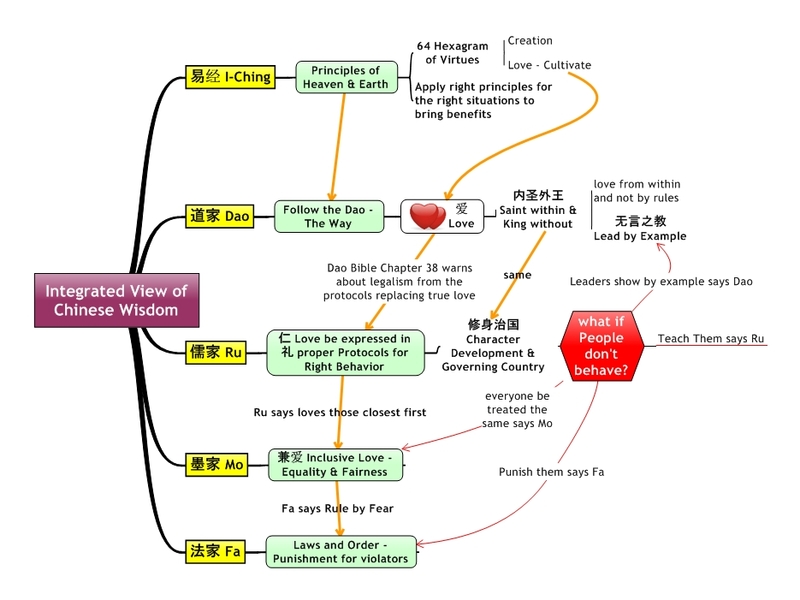 Read my posts on self-management such as The Future Of Management is Ancient Chinese Classics, Integrated View of the Wisdom of Chinese Classics – Future of Management Now. Build Morale – Celebrate and learned from past successes and get ready for the right time to charge forward. Most people have “Defect fixing” mindset. They focus on their failures and weaknesses and forgot about their successes. Have a “Positive Appreciation” mindset instead. Study your success and learn what make you successful. Find out your core competitive strengths and re-examine whether you have lost it. When company grows, complexity set in and the core-strengths slowly get lost in the midst of growing. Back to your basics and cores. Celebrate those things to bring up the morale and clarity of strategies. Get Alignment – Return to strengthen unity and alignment first. Put the right people at the right jobs. Many businesses can grow quickly when small. But if the business is not built to scale, the growth will straight away amplifies the weaknesses of the business. the mission, vision and strategies are shared and cascaded through out. the processes are streamlined. So see what can be standardized, centralized, modularized, optimized, outsourced (to partner that share the culture), prioritized to support the mission and vision. Pick and put the right people on the right jobs. Get information and trust flowing. Get the engagement of staff high. Then you are ready for growth. Get Support – Have a meaning mission and a proven character, friends will come to support you. Growing and big business needs support, from staff to customers, to suppliers and the bigger social network. Having a worthy mission helps inspire people. Examine your mission. Are you making the world a better place to attract the support that you need? Are you inclusive enough to accept diversities? Do you welcome and respect different ideas from the wider external networks of customers, suppliers, partners and the social network. Get Talents– Get support of leaders of power and influence and have worthy pursues. I-Ching often tell us to get support from the “Big People”. People with great wisdom and influence. Some you can hire them. For those who you can’t hire, then get them to sit on your advisory boards. At the very least, join them in their circles. Having mentors is a great thing for your growth. Now, if your growth have been impeded much, you may want to go through the above teaching to find out where you need to build and change. All the very best to your health and your business. Translated: Forget about oneself, handle things with humility and gentleness (as if empty). When on a boat crossing a river, you are hit by a boat. If the boat is empty, we will not be angry if even we are bad temper. However, if there is a person on the boat, we will break out with hurting words. So, if only we can stay with this concept of ’empty boat’ to handle things in life, we will never have a fight with another. This is about forgetting oneself, or our self interests. Because of the existence of me, there is therefore a concurrent existence of you. Between you and me, there always will be comparison of strong and weak, good and bad, success and failure. If we are not such self-aware and not insistence having my way, then we can make ourselves as if non-existence, no form nor shape, then we can meet up with whatever situations and be at peace, and be joyful with little things like seeing fishes and knowing they are swimming happily. How cane will experience life? There is only one method. That is to point out the contradictions. The question I had was whether I can build on this and discover other things. 在繁忙的马路上, 被别人的车撞上, 如果是救伤车, 里面还有病人, 我们就不会很生气. 我们会尽快解决, 或者甚至算了, 叫他们快走. 顾及他人, 损己利人 是易经 41 损卦的教导. 助人为快乐之本也! We find the two poles. The opposite of ‘I’ is not “no I” but ‘others’ or at least ‘Him’. So, we do not just forget about our own benefits, we should think about the benefits of him or others. We update the means of transport from boat to car. In a busy traffic, if we are hit by a car, we will be upset. But if we are hit by an Ambulance carrying a sick person in an emergency, we will want to quickly settle the issue and get the ambulance on its way. We may even forget about the damage to our car and wave the Ambulance off. The principle for happiness in life becomes “Caring for Others. Taking from Oneself and Benefiting Others”. This is in fact the teaching of I-Ching Hexagram 41損 Decrease – Give, Invest, Less is Better(need to register). Or see ‘Less is More 41損 Decrease’ (http://mind-value.blogspot.com/2011/03/less-is-more.html) It is a common proverb that helping others bring joy to oneself. If you are a Christian, then the secret of happiness is “from Me to Him”. Focusing on Him, Jesus Christ, our Savior, will bring joy to our heart. We have the famous hymn, “With Christ in the vessel we can smile at the storm!”. Most of the problems and suffering in our life is the focus we have on ourselves – our needs, our pride, our face and our hurt. True joy is found is shifting our focus “from me to Him” or if you are a non-Christians, then “Shift focus from me to others”! Lim Liat copyrighted 18 Sep 2011. I argued that the practices of the future of management discussed in management books and blogs are in fact something very old. They are found in the Ancient Chinese Classics. Here is a integrated view of the Wisdom of Ancient Chinese Classics. I don’t use the term Classical Chinese Wisdom as there are many Ancient Chinese Schools of thoughts. This integrated view is to show the key similarities and differences among the Ancient Schools. The foundation of Chinese wisdom is from I-Ching. It tells us that there are unchanging principles revealed by the Creator in the ways the Heaven and the Earth work. The virtues are captured in the 64 Hexagrams. The main virtues are creation and the ‘love and care’ for the created. Man can live well by following and applying the right principles for the right situations and living in harmony with ‘Heaven and Earth’ and with one another. The wisdom is “READ and understand the SITUATION and then apply the RIGHT PRINCIPLES to change the situation for good or preventing the good to decay to bad”. The DAO school of Lao Zi recognizes the WAY of operation of the heaven. His main teaching is ‘to follow the WAY and not to work against it‘. Following the WAY will be effortlessly easy, productive and self-sustaining. One of the virtue is LOVE, the soft rather than hard, the pull rather than push, the forgiving rather than punishment. Lao Zi warns that the setting of rules to compensate for the lack of love will not be effective. It can result in legalism where the rules become the goals and be more important than the people. The Ru School of Confucius teaches Love (Ren 仁), and love to be expressed with the right protocol of behavior called Li 礼. Love begins with loving our own, those closest to us before extending outwards. Confucius believes in education. 仁义礼智信勇 Love, Righteousness, Rules of Conduct, Wisdom, Trust and Boldness are the virtues promoted by the Ru School. The key difference between the love of Ru and love of Mo (see below) is that Ru prioritize love according to the closeness of relationships where as Mo stresses on equality. For Ru, one shall love his parents and siblings more than relatives, friends, and then acquaintances and strangers. Mo Zi believes in equality of mankind. Love extending to everyone. It stresses on fairness and treating everyone equally. This school stresses on establishing strict Laws and Orders by incentives and severe punishments. It is about forcing the right behavior out of people by fear. Besides the 4 main schools, there are others popular ones like the Strategies and Warfare School of Sun Zi and others, the Logic School, the Mathematics, the Yin-Yang, and many others. See Ancient Chinese Wisdom. What if People do not behave well? I-ching school tells us to study the problem first and then apply the right principles. Dao tells the leaders to set and lead by examples. Mo tells us everyone must be treated the same way. There should be no favoritism; i.e. the rich and powerful should not be above the low and poor. Fa tells us to punish the violators severely so that they can learn the lessons and dare not try to be funny again. How can the learning here be applied to management and leadership? The highest of form of leadership and management is self-management where the people work out from and for themselves. You can find the answers from the above. Does not the Bible teaches similar things – servant leadership, Kingdom Principles and Virtues? Please share your wisdom with me by posting your comments here. In the book “The Future of Management” Gary Hamel told us to have innovation not just for products, services, or processes but also the management of organization. In this present world where creativity and adaptability drive business success, the present ways of control from the top may not work any more. Let me quote from pg 254, “Yet it does herald a future in which the work of managing will be less and less performed by ‘managers’. To be sure, activities will still need to be coordinated, individual efforts aligned, objectives …. but increasing, this work will be distributed out to the periphery.” To me, it means, in short, “Self-Management” or “Self-Directed Team”. Dov Seidman is explicit in his book “How: Why How We Do Anything Means Everything…in Business (and in Life)” and uses the term “Self-Governance” as the highest stage of a corporate culture. Please check it out to see how to reach that stage. I am much impressed by Vineet Nayar’s book “Employees First, Customers Second: Turning Conventional Management Upside Down” which give his personal account of how he goes about doing it “Towards Self Direction” (pg 164). It was a journey starting in 2005 and involving a large number of people (in tens of thousands across the Globe) and the success of HCL is a testimony that it (Self Management) is possible and it works. Leadership by serving the employees to serve the customers better was not new too. Jesus taught that in (Matt 23:11) But he that is greatest among you shall be your servant. There are now many books on open leadership, trust, transparency etc to move the responsibility of change and direction from one person at the top to self-directed teams in the front line (or the fringes in Hamel’s term) of delivering the value adding services to the customers. The world is too complex, changing too fast, and requires knowledge and wisdom that go way beyond the capability of a hero or superhero CEO. The answer to sustainable growth lies in motivating and harnessing the wisdom and passion of the crowd toward an shared mission and vision and values. This is the ultimate stage where all the dragons are fully matured righteous men. There is no need for a leader to lead them. They all know how to live peacefully and harmoniously and happily with one another. That is the true blessings. Heaven is it! Heaven is only heaven if it is filled with righteous people. Heaven is hell if it is filled with immature and evil people. Another interpretation is that among the 6 dragons of the six-stages, there is no one that is the leader. The moral teaching is that leadership is situational – it depends on the time and the situations. There is no one right way of leading. The Ancient Chinese has a better term for “Self-Management”. It is called “无为而治”. The literal translation is “No action yet in order”. I would translate it as “Effortless Management” or “Managing with out stress and efforts” or “Easy Management” . It is not that we don’t do things as many have misunderstand Lao Zi. It is just that the things we do are easy and effortless for us because we follow the right ways (DAO). How can we achieve that effortless management ? The books quoted above give us some answers. But the Ancient Chinese Classics have more to share with us. Trust, openness, flexibility, transparency etc are all part of the process. I-Ching tells us how to do that in various situations. In Chinese History, the Period called the ‘Spring and Autumn’ & ‘The Warring states’ (BC 770 – 221), is the period where most main Chinese Philosophies are developed. They were 4 main schools of thought that last to today. Each has his own way for achieving this “Effortless Management”. It is not easy for me to go through them in details. I just wish to point it out to you for you to discover more yourselves. Chinese wisdom is not just “Sun Zi’s Art of War”. I personally find Sun Zi’s Arts of War as incomplete. It covers competitive strategies. But business to me is a love affair with customers rather than a war with competitors. Competitors are just interfering references in the customer’s eye when she is deciding. Business main and only goal is with the customers. See Business as War is Half the Truth. The are many other issues, more important ones than competitive strategies, such as PEOPLE, learning, knowledge, team work, to name just a few. These answers to the future of management can actually be found in the Chinese Classics. Back to the four main Chinese Classics Schools (We are talking about philosophies and not the religions). The oldest school is Dao (The Way) headed by Lao Zi 老子 and Zhuang Zi 庄子. They tell people to follow the natural way or natural order and then things will be easy, effortless and automatic. Of course, we have to first find out about the Way and the How. Dao De Jing is a good source. The 2nd, but having the largest influence, is the Ru儒 School of Confucius and Mencius. They teach about being morally good and self-independence first and then with love and caring to touch and change others lives and behavior; thereby achieving effortless management since everyone can behave well by their own will. It stresses on establishing Li – good manners and protocols of treating one another. It is leadership and management by Virtue (The keys being love and respect). The teaching of Confucius is contained in Lun Yu, The Great Learning DaXue, The Doctrine of the Mean, and others. See also Learning Innovation from Confucius – The Series). The third school is Mo 墨 of Mo Zi. He stresses on “Love” and “Loving everyone regardless of status”. He is closest to the Agape Love of Christianity. Leadership and management is by love and treating everyone equally. Ru also stresses on love and kindness. But Ru believes in loving your own first and then extending outward. Mo Zi reaches out to the poor and peasants. Confucius was closer to the aristocrats. May be Mo looked at thing from the labor point of view and Confucius from the rulers point of view. The fourth school is the Legal School of Han Fei Zi 韩非子。He believes in establishing strict Laws and Severe Punishments to achieve effortless management. He believes in ruling with fear so that people will not dare to be bad. This like the theory X type of management. This is the practice of the famous Chin Shi Wang of the Chin Dynasty. This is also our familiar centralized bureaucratic organization. Which of the four Schools should you follow? Which one will be the future of Management? Everyone has its ways and rules of working, even the Dao. In the spirit of I-Ching, it depends on the situation – the people, the timing, the direction, the stages of growth and the environment. Chinese Classics are vast resources to read. May be you can follow me and learn slowly over time by reading Ancient Chinese Wisdom . Please share with me your thoughts as well.